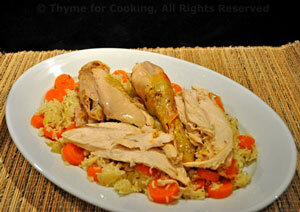 Braised Chicken with Rice and Carrots, easy gourmet dinner recipes. The Chicken with Rice is a simple, classic French housewife's dish. Everything but the rice goes in the pot and then it's left alone for 2 hours. Leftover chicken makes great sandwiches - or double the rice and carrots for another meal. This is a classic in farm houses through out France! Find an older, stewing hen, if you can. They have more flavor and the long cooking time will make them tender. Not a roasting hen, they're too big to fit into most pots. 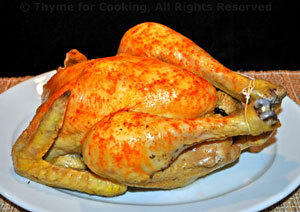 A broiler/fryer will work as well. This will be enough for 2 meals. Peel and cut carrots in half the long way (I cut them the in half the short way first - it makes it easier). Then slice the carrots into 1/4" (.6cm) half circles (the short way). Using a small ladle remove 1 cup of liquid from the chicken. Put it into a saucepan along with the rice. Don't worry if you get a bit of onion with the stock. Remove chicken, add onion, carrot, sauté 5 min.